Fittingly, New York’s Museum of Modern Art opened the centennial exhibition of Inventing Abstraction before the end of 2012. It is a very handsome show, full of varied and vigorous pictures celebrating a new medium that since has swept the world. I enjoyed the show thoroughly and learned a lot. I never realized how powerful these early art works were and I will return to the show before it closes in February. Upon entering the exhibition visitors view a big chart detailing the interconnection between artists involved with the creation and rapid dissemination of this new art form. There were well-known names like Vassily Kandinsky, Pablo Picasso, Marsden Hartley, Piet Mondrian, Fernand Leger, Robert Delaunay, Sonia Delaunay-Terk, as well as many lesser-known ones. 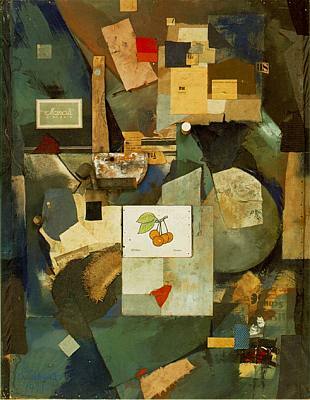 One of the latter includes Kurt Schwitters, who is represented by two rather nice collages: Das Kreisen (The Revolving) of 1919 and Merzbild (The Cherry Picture) of 1921. I rather liked both. Like my parents, Schwitters lived in Hanover, Germany. He was a casual acquaintance of my mother, a small time art collector. One evening my parents decided to attend a masked ball, a fundraiser of Hanover’s Modern Art Museum, the Kestnergesellschaft. They decided that each was going to spend the evening with a blind date. My father ended up with a cute secretary and my mother with Kurt Schwitters. As the evening wore on my father treated his date to lavish refreshments, while my mother enviously watched the refreshment stand. Finally she approached my father’s table. He proceeded to order some food for my mom, whom he introduced as his neighbor. Smelling the treat, Schwitters too sat down, profiting from my father’s largesse. At the end of the evening, much to the secretary’s regret, for she had apparently expected a romantic end, my father insisted on offering his “neighbor” a ride home. This entry was posted in Uncategorized and tagged abstract art, art collecting, art collection, collection, das kreisen, family story, inventing abstraction, kestnergesellschaft, kurt schwitters, masked ball, merzbild, modern art, moma, museum of modern art, new york, pablo picasso, picasso, schwitters, sonia delaunay, sonia delaunay-terk, the cherry picture, the revolving. Bookmark the permalink. Wow! A story I never heard!